They think these two clans are just the same style of kungfu using two different names. In fact, the Wing Tsun style is quite different from the Weng Chun style. 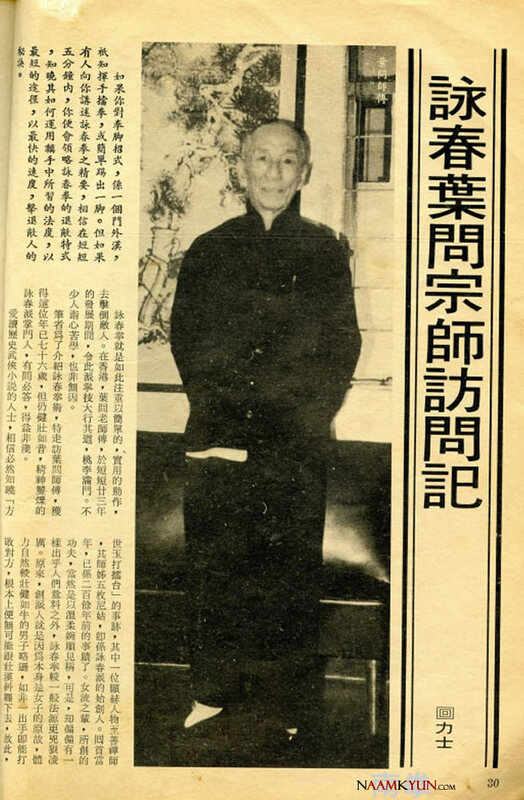 In Hong Kong, the leader of the Wing Tsun clan is Grandmaster Yip Man, whereas the leader of the Weng Chun clan is Grandmaster Chu Chung Man. The techniques and boxing sets are also quite different. For example, in the Wing Tsun system there are kungfu sets such as Siu-Nim-Tau, Chum-Kiu, Biu-Tze, Wooden Dummy and the Six-&-a-half Long Pole Techniques. However, in Weng Chun, there are Wooden dummy, Bart-Mo-Dan-Da or “Eight-Single-Fighting-Ways”, Lin-Wan-Kou-Da or “Chain-Punches with Trapping Hands”, as well as the Six-&-a-half Long Pole Techniques. The reason these two styles are perceived as being the same style is that they have some techniques in common, though some of the concepts are different. For example, both of them apply the Noi-Lim-Sau or “Indoor sickle-like hand” technique, and both of them exert the Chuen-King of “Inch-force”. Noi-lim-sau is a technique for a practioner to get into his opponent’s indoor-area from outside. Just as though he was using a sickle to cut in. This technique requires elbow-force and a very small circling movement. Therefore it is a very quick counter-attack technique. Grandmaster Yip was a Fatshan native. When he was very young, he was quite weak. Therefore, his parents sent him to learn Wing Chun from Chan Wah Shun, the most outstanding student of the famous Dr. Leung Jan. When Grandmaster Yip described his past, he did so with great warmth. Here is a segment of the interview in its original format. 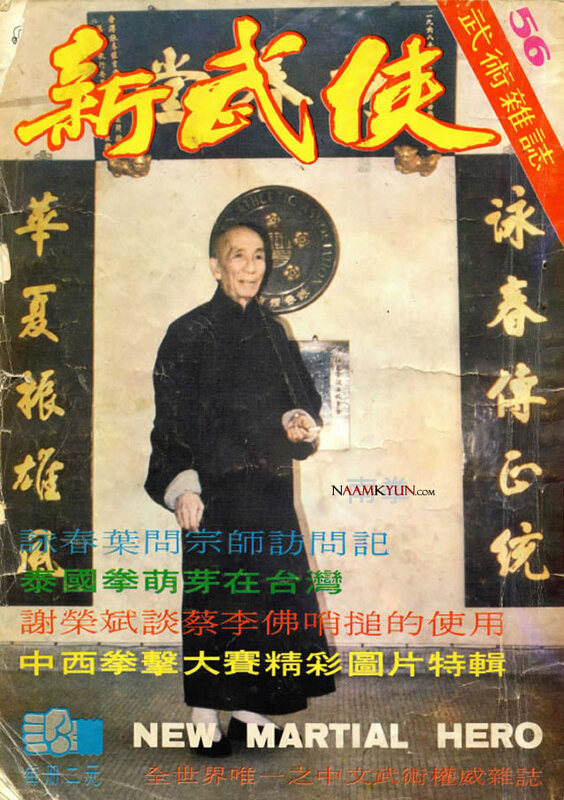 Yip Man: “This nickname does not represent my instructor’s character. Other than ‘Wah the Money Changer’, he had also a less graceful nickname. ‘Ngau-Chin Wah’ of ‘Wah the Bull’. He was the headstudent of Dr Leung Jan”. “It’s a good question. Let me tell you why. In olden days, people were very strict concerning the teacher/student relationship. Before they admitted a student, they had to know the character of this would-be student very clearly. This is what is called ‘to choose a right student to teach’. Secondly, it also depended on whether the student could afford to pay his school fees or not”. 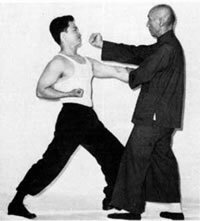 At the time Grandmaster Yip left Fatshan to go to study in Hong Kong, was already very skilled in the basic wing chun fighting techniques. He always fought with his classmates at the school. 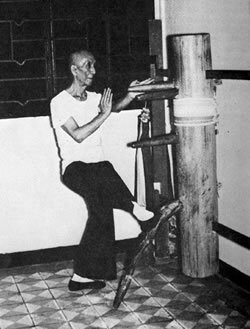 Although Yip Man was not tall, he was very skilful in fighting techniques. Therefore, he could defeat all his classmates, even those that were much taller and stronger than he. For this reason, he became arrogant for he believed that nobody could match him. 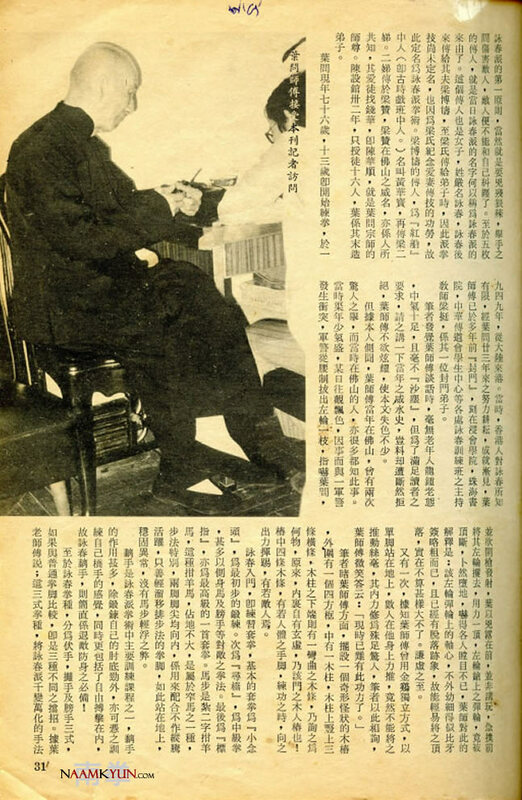 After six months, one of Yip Man’s classmates, surnamed Lai, whose father ran a big silk company named “Kung Hang Silk Company” in Jervois Street of Sheung Wan, told Yip that there was a friend of father’s living in their house. He was in his 50s. This man knew some kungfu techniques. He offered a friendly sparring with Yip Man. At that time Yip had never been defeated, and so he wasted no time in accepting the challenge. Lai made an appointment to introduce them to each other on one Sunday afternoon. On that Sunday, Yip went to the house of his classmate. After being introduced to this middle-aged man, Yip looked at him appraisingly. To Yip’s eyes, he looked more like a typical slim-gentleman than someone who really knew kungfu. After a short, Yip Man frankly challenged the man to a sparring match. On hearing this, the arrogant Yip Man, though apparently still unruffled, was actually so mad that all he wanted to do was to beat this man up! No sooner did the middle-aged man give Yip Man a hand-signal inviting him to attack than he was subjected to Yip Man’s aggressive rain of punches. However, this man was so quick that Yip Man could not match his counter-attack movements. 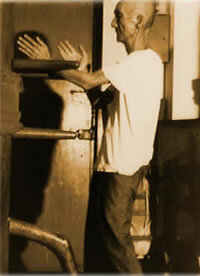 In an instant, Yip Man was forced to withdraw into a corner. The man stopped at the same moment. After the first contact, and already defeated, Yip Man could not believe that this man had gained the upper hand so quickly. Therefore, he asked the man if he could try again. Once again, Yip Man was completely controlled by this man. He could not do anything against him! This time, Yip Man knew that he had surely been beaten by a real kungfu expert. Without saying a word, Yip Man went away with great disappointment. After that friendly sparring match, Yip Man was so depressed that he did not even dare to mention that he knew kungfu. 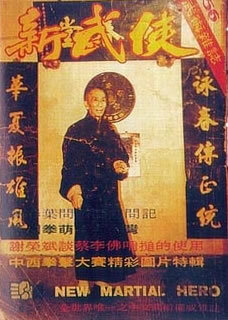 However, to Yip Man’s surprise, Lai told Yip that his father’s friend actually praised Yip’s kungfu techniques highly. That was why he wanted to see Yip and talk to him again. Lai started telling Yip Man the secret of his father’s friend. 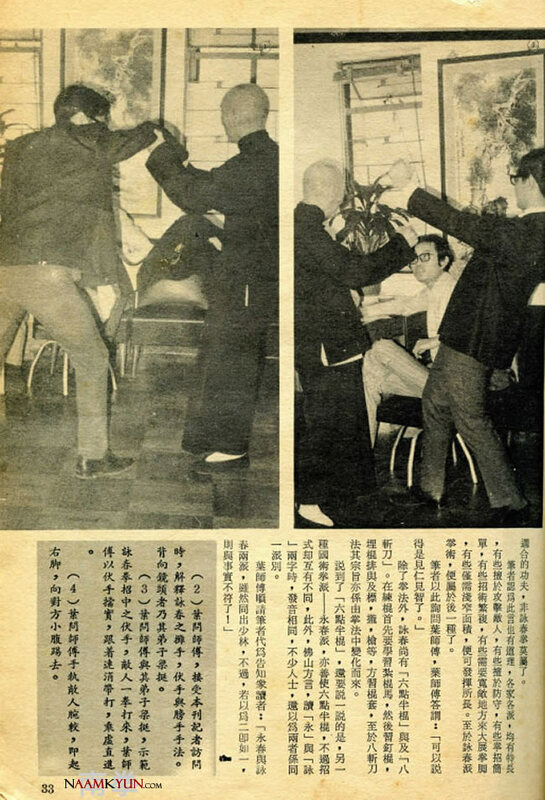 In fact the one who had fought with Yip Man was none other than Leung Bik, the son of Dr. Leung Jan! Immediately Yip Man’s realized what an opportunity this was. He was still not that highly skilled in the kungfu techniques taught to him by his si-fu Wah the Money Changer. This would be the best chance for him to learn the more advanced Wing Tsun techniques. Therefore, he wasted no time in asking Lai, his classmate, to take him to the Kung Hang Silk Company to meet Leung Bik. 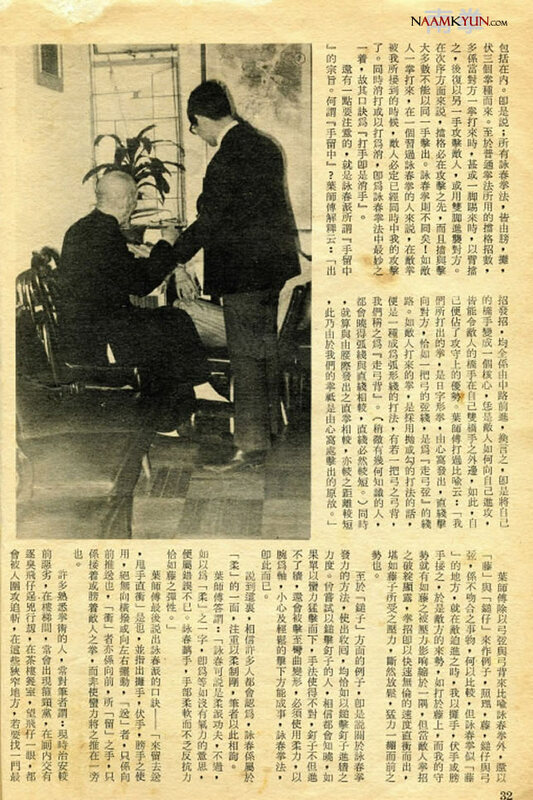 Since Yip Man was a genius in terms of learning kungfu, Leung Bik was very happy to teach all he knew to Yip Man. A few years later, Leung Bik got tired of living in Hong Kong and was thinking of going back to Fatshan. 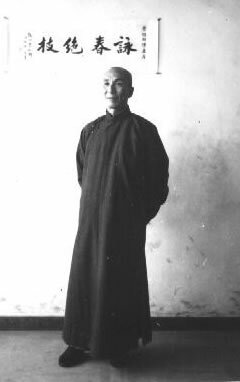 At that time Yip Man had already attained the highest proficiency in kungfu techniques. Back to Fatshan. At that time Yip Man had already attained the highest proficiency in kungfu techniques. thanks for posting this resource. i tweet it for sure. Yeah, I’ve had the same Leung Bik was not real argument with people, nice to have some evidence. From Ip Man own word that Leung Bik did exists! Thank you for your kind words, i am happy you like the website! Looking forward to hear more from your memories and experience.